‘Tis the season of stuffy noses, persistent coughs, and sore throats. It’s officially cold and flu season. And even though the team at our dental office in Evansville is committed to keeping our patients and neighbors healthy, there are just some things we can’t fix. The common cold being one of them. 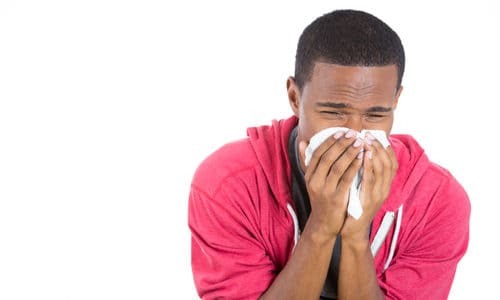 But while we may not have a cure, we do have some tips on how to keep your teeth healthy as you treat that pesky cough. Even though the sugars found in many cough syrups and cough drops don’t necessarily have medicinal benefits, they do still have a purpose. Many medicines add sugar to make them taste better so that people can tolerate drinking or sucking on them. But these sugars give the bacteria in the mouth something to feed on, and that’s concerning for your Evansville dentist. As bacteria feed on sugars they release an acidic byproduct. This acid wears away the protective layer of tooth enamel and leaves teeth exposed to decay. All of us at our Evansville dental office hope you can avoid catching a cold or the flu this season. But if you happen to come down with a sickness, follow the tips above to help you feel better and protect your smile at the same time.